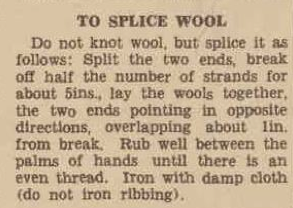 The method I use to join yarn or to 'splice wool' comes from the AWW. Of course, there are other methods, but this one works perfectly when knitting a vintage jumper because it won't cause any lumps and knots. This works well for wool because it incorporates a bit of heat and rubbing which causes felting. This is one of the characteristic of wool but not for cotton or acrylic! Therefore it won't work on other type of yarns than wool. These instruction was used quite often by the AWW. Usually, during the 1930's bits and pieces of such information was included with the knitting patterns. Note: I use less than the 5 inches instructed, I found about 2 or 3 is sufficient enough. The joined part is as strong as the original wool. Below all of the steps, illustrated with two different colors of the same type of yarn.